As some of you know or by now have guessed, I have written two series, one the Eden Paradox, a science fiction series, and the other a spy thriller series, under the name J F Kirwan. Having finished both series, the question I find both my 'halves' being asked, is what next? I wanted a short sabbatical from SF, to work on characterisation, and I'd had two serious back operations that had stopped me from scuba-diving, my other passion, so as an exercise I started writing a thriller with scenes borrowed from some of my scarier diving moments. It was just for fun, but I sent it out and took it to a writers conference, where it got roundly hammered. Nevertheless, I put in all the reviewers' suggestions, even one I thought was wrong and completely off-beam, and sent it out again, and got it accepted by... HarperCollins. Not only that, they wanted a three-book deal. Guess what I said? But by now I'd started another science fiction story (I don't sleep, you know that if you read my blogs), titled 'When the Children Come', which was meant to be a prequel to a short story I wrote (actually intended as a tribute to Iain Banks) called Executive Decision. I was already a third of the way through the book when the deal with HC came through, and so I had to shelve the fledgling novel. So, to cut a long story short, I'm going to finish the 'Children' book before I do anything else. The premise is pretty dark, and it's single protagonist, so we get to see everything through the eyes of Nathan, a damaged American war veteran who did one too many tours in Afghanistan. It's intended to be a trilogy: When the children come, When the children return, and After the children. 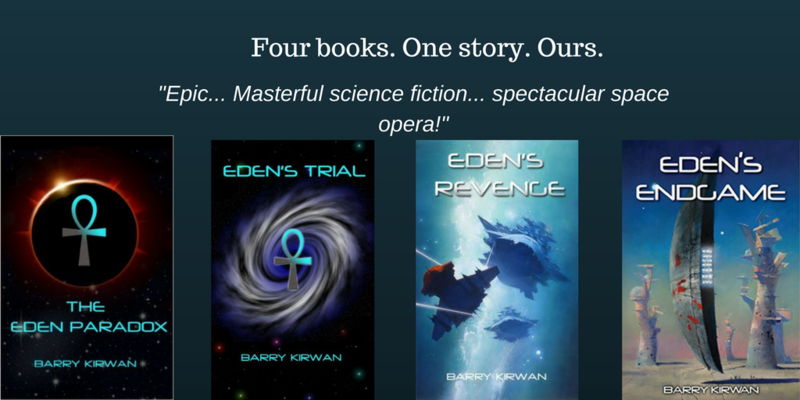 As with Eden, it is as much about us as it is about aliens, and about a possible dark future pathway for humanity. Set today, it will include some of the darkness already on our planet, from child soldiers to racial tensions and hatred, that could be our undoing. But there will always be a spark of hope, because that is why I write. Does this mean the thrillers are now on hold? Probably not for long, but as the saying goes, and as Nathan does in the end, I'm going to put the children first. To see more on the thrillers, see my other website here.